Float therapy is a form of sensory-deprivation. There are many therapeutic float therapy benefits including pain relief, anxiety reduction, mood enhancement, relaxation, & sleep improvement. A float tank is insulated from sound & light allowing you to separate ourself from the outside world. When floating on water filled with Epsom Salt you cannot tell where your body ends & the water begins, allowing for a uniquely relaxing experience. 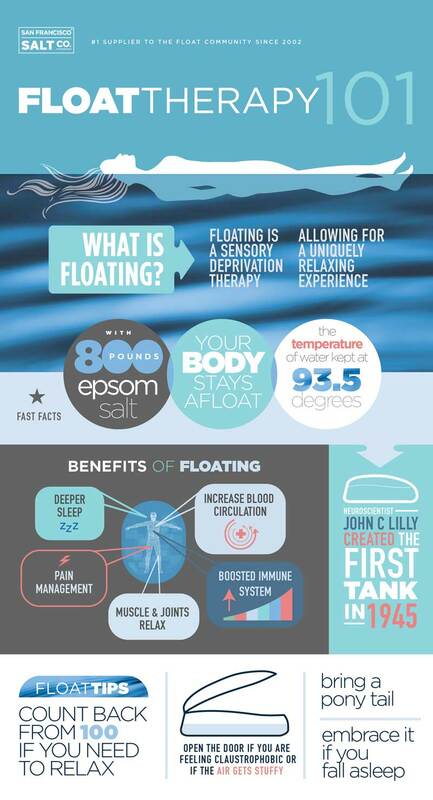 There are many float therapy benefits for the body & mind. If you are worried about it being too dark, or feeling claustrophobic, you can roll up a towel to put between in the door to allow little light and air to come in. Definitely use the ear plugs that the float center will give you - your ears will be submerged under the water & they also assist in blocking out extra noise. There is no right or wrong position to float in! Just make sure you are relaxed and in a comfortable position. If you cannot relax during your first float, that is okay! Some people fall asleep the first time & some can't seem to relax at all. Give it a second chance! ​There are so many float therapy benefits that one can see after just one time of floating, but most benefits are seen after routine practice. 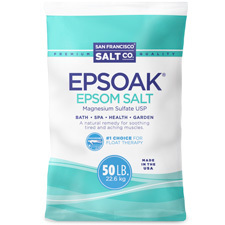 We are the #1 supplier of Epsom Salt to the float community!